Its sophisticated function will enrich your daily workflow of examination. CS-7 can control AeroDR detectors and connect to Regius CR readers. CS-7 has multiple function which provides you useful workflow. Control AeroDR detectors and KonicaMinolta CR devices. 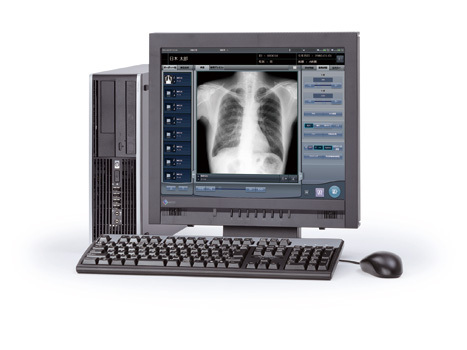 Send patient images to PACS and Dry Imagers. Obtain examination information from RIS and send back each results. Link up X-ray exposure condition with X-ray console. Write patient image on CD/DVD with DICOM, PDI and JPEG format. After exposure, a preview image immediately appears on the display of the CS-7 console in less than two seconds. The CS-7 has a user –friendly graphic interface adding powerful proprietary functions. GUI design can be modified to customer preferences flexibly, succeeding the conventional console design.